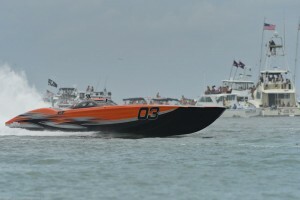 Mercury Racing Powers MTI to Triple Crown Championship Status! Read more from Mercury Racing, below. “The goal all along was to finish 1-2. Jeff and I placed second on Wednesday (race 1). We were taken out early Friday (day 2) when Team CRC rode up on some rooster tails and ended up hitting us in turn 1, resulting with a gaping hole on the port side of the engine compartment,” Johnny said. “MTI and Mercury Racing make a winning combination,” were the first words from Marine Technology, Inc., owner/CEO Randy Scism when we spoke this morning. “Triple Crown champs; Superboat Unlimited National Championship, Superboat Unlimited World Championship and Class 1 World Championship. It’s been an awesome couple of weeks,” Randy expounded. This may be the first time in history Mercury Racing has captured the triple crown. “We had a great year,” said Team CMS #03 driver Jeff Harris. “We ran every SBI race and the Lake Race at LOTO as well. Throughout the year, the only races Johnny and I didn’t win were the ones Bob and Randy won,” Jeff said. “The winning boats led every lap. A large part of that is the engines are so darn reliable – lap after lap – race after race. There simply are no issues and thus why the Mercury QC4vs are so dominant,” Jeff concluded. This article is originally posted to MercuryRacing.com.